at the moment have been so beautiful and inspiring. that I have come across. The colours though are what I love the most. (this one is a stamped Darkroom Door leaf which I cut out). leaves and images in them. A great way to show the images and a beautiful colour palette and design. Give me a muck around piece any day Dot and I am really enjoying reading about all the different techniques used. 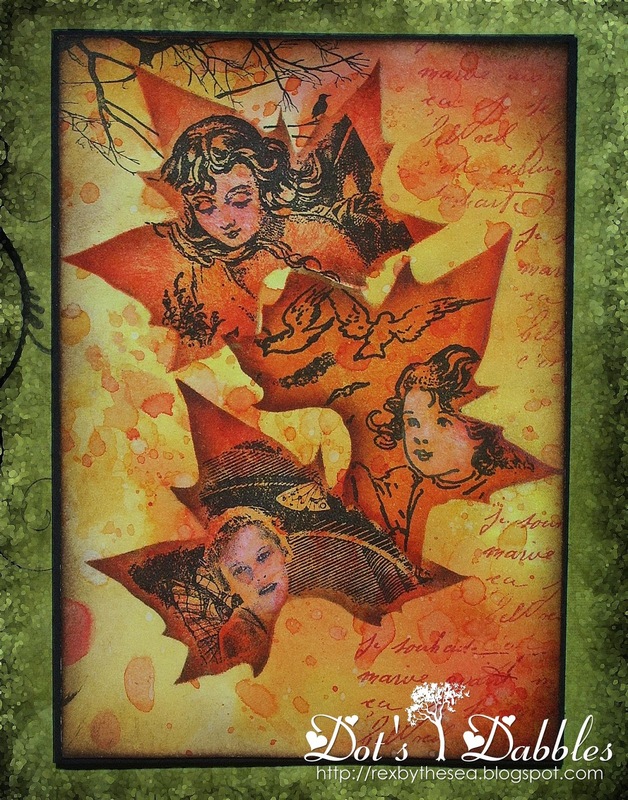 Stunning and what a great way to use both stamps and stencils, fabulous!! Beautiful way to frame those lovely images. Its a super project. A gorgeous idea, fabulous images. Lovely card. I like how you used very interesting samping tecnique. Great work. How fabulous is this – a great card and wonder playing with ink! Beautiful card! Looks like a piece of art!! What a fab idea! Your colour scheme is gorgeous! Thanks for joining in at Rhedd & Rosies challenge blog. Love the colour combinations. Thanks for joining us over at Creative Moments this fortnight. What a great card. I love the stamping. The images are wonderful. Thank you for joining in our challenge @ Parade Your Crafts. Such a perfect creation! I like the colors you use and your Fall scene which you made.